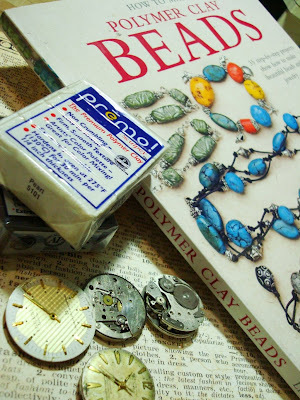 i have been thinking of playing with polymer clay for a while now. so when i received an sms from the craftshop i frequent, saying that new polymer clay stock has arrived ... i guess i dun have to tell you what happened. but ... i was a good girl ... i didn't buy a lot. i only bought 2 packs of 2oz premos. black and pearl. on top and bottom ... mistakes! Wonderful work Luthien, you never cease to amaze me! How very pretty. I especialy love the stars pattern. The incense holder does look like a tortoise shell. It is always fun to experiment with new supplies. Have fun with it! I once made a lot of jewelry using polymer clay for acraft show that was really successful. Have not really created anything more than embellishments for my journals as of late, though. I really love your first time creations. They look great. You are an inspiration! No laughing here. Dang good for your first time out, but then again, we all know how talented you are. Love the button especially since I collect them. Will you be selling buttons anytime soon? First of all it was great to hear you bought Premo. It is an excellent polymer clay to work with and is very strong, so you don't need to worry about it disintegrating when baked. But like I recommend for all brands of clay, I would bake it for an hour at 265F - 275F instead of the half hour on the package. This makes for a much stronger product. I have hundreds of polymer clay articles on my blog that are geared towards beginners that I think you will find very helpful. There are also video tutorials and courses available. You can ask me any question you like there and I will answer best I can. You did an excellent job on your beads and buttons. I think you will enjoy working with polymer clay some more. 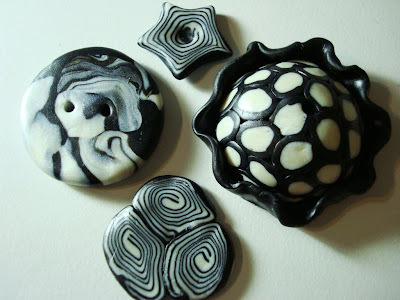 You've got a lot of potential as a polymer clay bead maker. hahaha!! you are right! i copied the incense holder design right off a bead!! but the brooch is a good idea :) one more thing to mess around with! yea... my hubby thinks i should put a head and tail and feet on the incense holder!! now... YOU are one lady that i know who is multi talented and can do anything! thank you my fren ;) that was the easiest combination for me i think ... as a first timer, i have no idea what colors to choose ... so safest, black and white (or pearl in my case) ... of course i went back the next day and got all the neon colors!! spurred by all your encouraging comments!!! thank you! LOL!!! but you can too! !